First Methodist Supports the Monarchy! 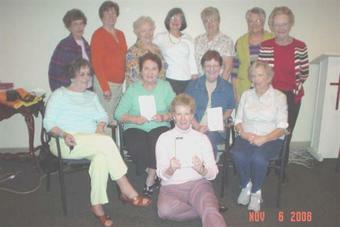 First Methodist Church in Hurst, TX has a book group! Who knew? And, despite a few of the... shall We say... questionable words in QUEEN OF THE ROAD, these ladies of impeccable taste, decided to discuss it, anyway. I think this group has the right idea: Meet at a fabulous restaurant first (no wonder they call themselves, "Food for Thought") then return to a church meeting room to discuss the book. When the food is Tai and the book is QUEEN OF THE ROAD, how could they go wrong? Some of the ladies apparently thought the food a bit spicy. As the book group leader said, "I should have told them about your website!" So, thank you, Clara, Lorraine, Nancy, Sarah, Phyllis, Carrie, Nancy, Roseann, Bobbie, Barbara, Clarita and Peggy (and especially to Nancy Nelson for setting this up) for your thoughtful questions. Next time I'm in Hurst, Tai is on me, ladies! when i saw the word "hurst" i was all "she better not have been in hurst and didn't tell me. nu-uh." i may have even done a finger snappy wavey thing. First of all, Patti, you're in such nauseatingly great shape, I know you could do me some damage, so I'd nevah do anything to offend you! Second of all, the ladies tell me Hurst is near Ft. Worth, which has a fabulous Prevost repair place (don't ask) so we may actually swing by there sometime. Third of all, if we do, I know how you feel about many a food, but how about Tai? My book group has picked your book for our April Read (will work out date with you for the royal phone call?). I will say that Martinis were a big selling point...we may actually have a sleepover for those who really want to test the recipes! This page contains a single entry from the blog posted on November 20, 2008 4:30 PM. The previous post in this blog was Field Trip!. The next post in this blog is Signs of the Times.